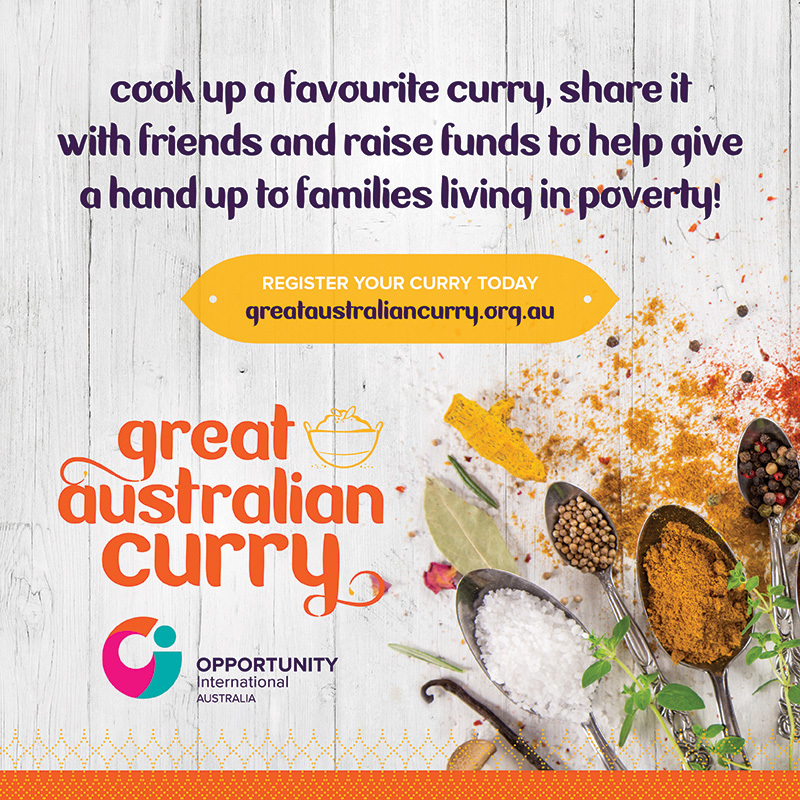 Great Australian Curry 2018 | Cook up a favourite curry, share it with friends and raise funds to help give a hand up to families living in poverty! Cook up a favourite curry, share it with friends and raise funds to help give a hand up to families living in poverty! Decide what kind of curry you want to cook and lock in a date for your event. You can share a spice night at home, host a curry cook-off at work or let the professionals do their thing by heading out to enjoy a curry at a restaurant, it's completely up to you! Follow a few easy steps to set up your fundraising page and goal. Invite your friends, family or colleagues along to enjoy your curry and show their support by donating through your fundraising page. Donations will help Opportunity reach out to families living in poverty in countries such as India, Indonesia and the Philippines. Too many people in the world live in poverty — and sadly, many of them right on our doorstep. Just past Australia's shores, Asia is home to family after family who struggle to earn an income. As a result, they go without three meals a day, clean water, safe shelter and even school for their children. Asia is also full of incredible curries — from the Korma Curry of India to the Green Curry of Thailand. Colourful dried spices hang in busy streets while the air is filled with the incredible aroma of street food and home cooking. By sharing a curry with friends, we can celebrate the vibrancy of these countries while also giving a hand up to families in need. Every dollar raised will help Opportunity International Australia provide small loans to families in Asia, giving them the tools they need to start their own businesses, earn regular incomes and begin to leave poverty behind. Find simple answers to your questions in our frequently asked questions. Find out everything you need to know to take part in the Great Australian Curry. Download our ready-to-use posters, place cards and food tags to help decorate your event and put everything in its place! Print out donation forms to collect donations at your event if your guests prefer to give in person. Invite friends and colleagues along to share in a curry. Find the fundraiser you want to support and get behind them with a donation that will change lives! 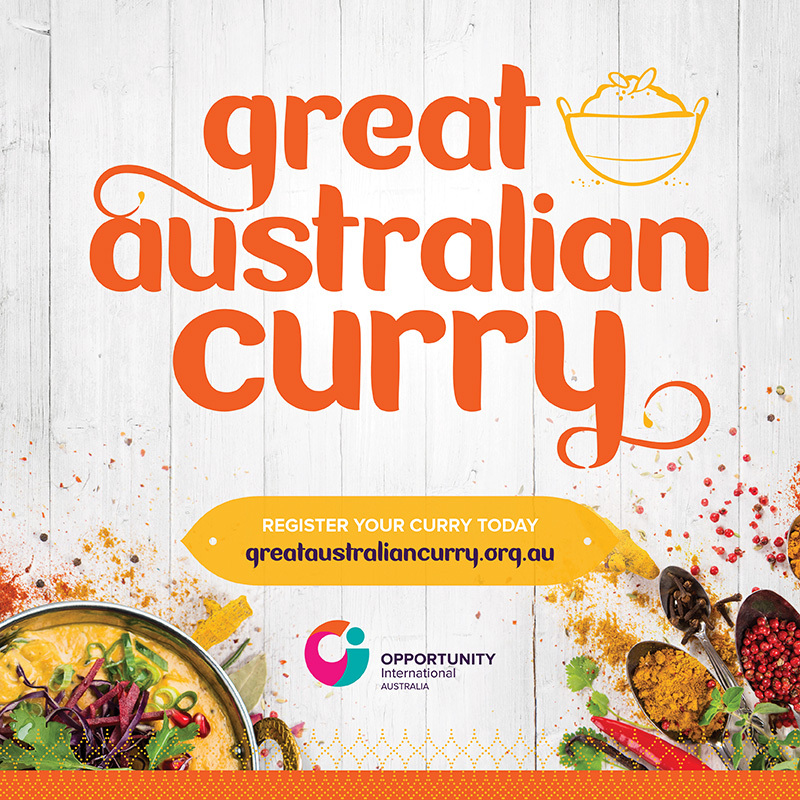 It’s time to get spicy, Australia – join the Great Australian Curry! I'm so excited to be supporting the Great Australian Curry! It's a great reminder about the joy a shared meal brings — and it enables us to make a difference at the same time, reaching out to families around the world and giving them a hand up out of poverty through Opportunity International Australia. Opportunity is an incredible charity that helps families around the world grow their own small businesses so they can earn regular incomes, provide for their children and leave poverty behind." We live in the best country in the world! We should never forget that. There are so many people around the world not as fortunate as us. It's really important to not lose focus of how lucky we are, just through the simple fact of where we live. 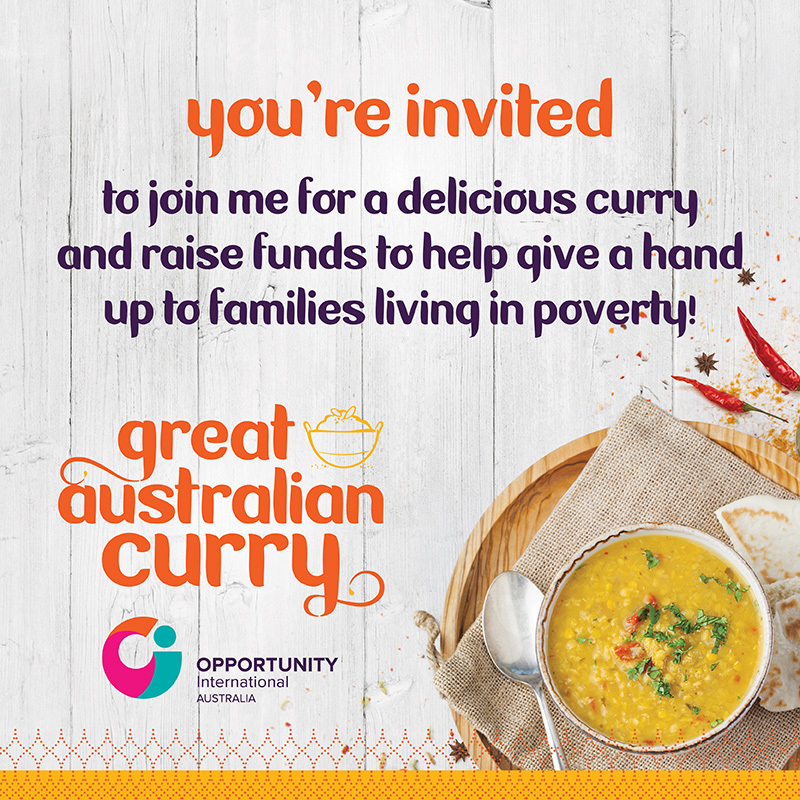 I'm really excited to be supporting the Great Australian Curry to help raise funds for Opportunity International Australia and the work they do helping families leave poverty behind." Wish you could take part in the Great Australian Curry but just can't this year? Donate instead and give a hand up to families in need. State ACT NSW NT QLD SA TAS VIC WA Outside Aus. Your card will be charged on the 15th of each month. Donations $2 and over are tax-deductible. If you do not want to receive marketing communications from Opportunity, please contact us on opinfo@opportunity.org.au or 1800 812 164. From mouth-watering curries and spicy sides to flavour-packed rice dishes and breads to impress, we've got a bunch of fun recipes to help make your meal a success! Sign up to receive email updates from Opportunity International Australia. Opportunity International Australia enables you to invest in a mother living in poverty so that she can use a small loan to buy an item like a sewing machine and start a small business. For a family in a developing country who can't afford the basics, a loan as small as $70 can be life changing. With this hand up, a mother can put food on the table, send her children to school and transform her family's future for generations. Mothers want what is best for their children, and as businesses become successful (98% of Opportunity's loans are repaid), your help means they can make their dreams for their children come true. Opportunity is motivated by Jesus Christ's call to love and serve the poor, serving all people regardless of their race, faith, ethnicity and gender. Wash the bhindi, pat dry with a cloth or paper towel and cut into medium pieces. Heat 2 tablespoon oil in a pan and add the bhindi. Fry the bhindi on medium heat till the sides turn brown. Take out and keep aside. Add the remaining oil and put chopped onion. Sauté for 2 minutes, add turmeric powder, red chilli powder, tomato, salt and mix well. Let the masala cook covered on low-medium heat for good 3 minutes. Add in the Bhindi. Put a lid on and cook the vegetables on low heat for more 2 to 3 minutes. Serve as a side dish with chapatti or rice and dal. Heat mustard oil in a pan add mustard seeds, coriander seeds, cumin seeds, red chilly whole, curry leaf let them crackle. Now add ginger garlic paste let it cook for 2 minutes. In a separate bowl mix yoghurt, gram flour, cumin powder, coriander powder, turmeric powder and curry powder with 1 litre of water add salt and sugar also. Mix it well. Pour this mix in first container and stir it then cover with a lid to cook on medium heat for 20 minutes. Let the oil come on the surface means the gravy is cooked nicely. Switch off the flame and add fried fritters in gravy, sprinkle fresh chop coriander on top. Serve it with steamed rice. For fritters - 10 cauliflower florets + 1 zucchini sliced in roundels mix with 100gms of gram flour, 1 tea spoon turmeric powder, 1tea spoon curry powder and some water to get a coating on cauliflower and zucchini. Put these coated vegetables in heated oil (150c) for few minute to get crisp and nice brown colour. Take out from oil and keep aside. Mix chicken in a bowl with half the curry paste, and mix to combine. Cover and set aside in fridge for 15 minutes. Heat oils in a large, deep frypan over medium heat. Add onion and cook, stirring, until softened. Add ginger and cook for 1 minute. Add remaining curry paste and stir for a few seconds. Add chicken and stir for a further 5 minutes. Place tamarind puree in a jug with 150ml boiling water. Stir to dissolve, then add to pan with coconut milk, lime leaves and lemongrass. Bring to a low simmer (don't boil as chicken will toughen). Simmer for 10 minutes, then add peas, fish sauce, soy and chilli sauce. Cook for 5 minutes, then add snow peas and cook for 1 minute. Taste and adjust seasoning if required. Stir through lime juice and chopped coriander. Serve on rice with lime wedges, and garnish with spring onion and coriander leaves. Add spinach to boiling water for 5 minutes then strain and leave to cool. Chop half the spinach, puree the other half. Heat oil in a pan, melt butter then add cumin seeds and let them crackle. Add gram flour and sauté until golden brown. Now add the cumin, coriander, curry powder and salt to taste. Add spinach puree and chopped spinach and cook for 5 minutes. Sprinkle in the fenugreek leaf and mix everything well. Add cream and water for consistency. Heat a skillet, add oil and heat. Fry the curry leaves, be careful as the oil may spit. Strain the curry leaves, and save the oil for the rest of the cooking process. Sit the fried curry leaf on a paper towel until required. Add the bay leaf and cardamom. Add the ginger and garlic paste and cook till it's lightly brown. Add chopped onions cook until it's translucent. Add tomatoes and green chilli and cook until the tomatoes starts to disintegrate. Add the garam masala, mango powder, turmeric and salt. Add the coconut cream and then the stock. Pour all the ingredients into the blender and blend to a smooth sauce. In the same skillet, add 1 tablespoon of oil. Add salt to the prawns and then throw in the spinach and wilt the spinach with the prawns. Garnish with fried curry leaves and red chilli julienne (seeds removed). Place lamb in a large, heavy-based saucepan. Season with salt. Add curry paste, cardamom, cloves, coriander seeds and bay leaves (see tip). Heat over medium heat. Cook, tossing, stirring, for 1 to 2 minutes or until fragrant. Add stock and vinegar. Bring to a simmer. Simmer, uncovered, for 30 minutes. Add coconut cream. Cook, uncovered, for 20 to 30 minutes or until cream mixture has thickened and lamb is tender. Spoon into bowls. Serve with lemon and coriander. Place all sauce ingredients - except whole star anise - in a food processor. Process well to form a thick curry paste. If you don't have a food processor, simply chop onion and herbs finely and combine with the coconut milk, spices, and other ingredients. These herbs and spices can also be ground together with a pestle & mortar. Do a taste test for salt and spice, adding more fish sauce if not salty enough. If not spicy enough, add more fresh chili, or chili sauce. If too sour, add a little more brown sugar. Place sauce in a wok or pot over medium-high heat. Add chicken pieces plus the whole star anise and stir well. Continue stirring occasionally as you bring to a boil. Then reduce heat to a simmer. Do not cover, as you want the sauce to reduce and become thicker. Allow the curry to simmer, stirring occasionally, for up to one hour, or until meat is cooked and tender. The sauce will reduce, so that it is almost like a coating on the meat (plus there will be a little sauce leftover in the wok/pan). Serve directly from the wok/pan with any extra sauce poured over. Garnish with a sprinkling of fresh coriander. Serve with Thai jasmine-scented rice or Easy Thai Coconut Rice. This dish can also be served with flat bread. Enjoy! Combine coriander, cumin, turmeric, pepper, chilli, garlic, ginger and lemon juice in a bowl to form a paste. Set aside. Heat 1 tablespoon of oil in a large saucepan over high heat. Add half the beef. Cook, stirring, for 2 to 3 minutes, or until browned. Transfer to a bowl. Repeat with remaining oil and beef. Reduce heat to medium. Add spice paste. Cook for 1 minute. Return beef to saucepan. Cook, stirring, for 1 minute, or until meat is coated with paste. Add tomato paste and stock. Bring to the boil. Reduce heat to low. Cover. Cook for 1 hour 45 minutes, or until beef is tender. Remove lid. Cook, uncovered, for a further 15 minutes, or until sauce has reduced and thickened slightly. Serve with rice and raita. Top with mint , coriander and fresh chilli (optional). Mix all ingredients in medium bowl. Season to taste with salt. Chill raita, covered, until ready to serve. In a large bowl mix the flour, black pepper, cumin and salt. Add the water and knead the dough by hand until it is smooth. Divide the dough into 12 to 15 balls and roll out one ball at a time to a very thin round layer about 1/8 inch thick on a slightly oiled surface. Place on lightly oiled cookie sheets. Place the papadums in the oven preheated to about 200 degrees F.